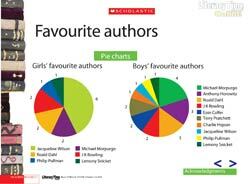 This recount – of a fictional class survey of favourite authors, carried out on World Book Day – is in presentation format as if compiled by a child. It includes bar charts, pie charts, plot graphs and tally charts. The presentation also asks the audience to consider whether the results were fair, which sets of data give the most information, which leave things out and so on. The resource can not only be used to look at the language used to recount the survey, and the mathematical vocabulary required, it can also be used to stimulate the children’s written responses, summarising the data and writing an argument for or against the results. Look through the presentation together and explore how to use it with the children. What does a survey mean? Have you come across this word anywhere before? How does the on-screen resource show the data and help us understand the data more? Investigate some of the questions together. Do all the children agree? Why not? How can you collect data from the pictogram? Discuss the findings with the children. Would they be the same in your class? Why not? Look together at the language written in the recount. Explore the language used and talk about why the author had chosen certain words. Can the children think of better words to use?